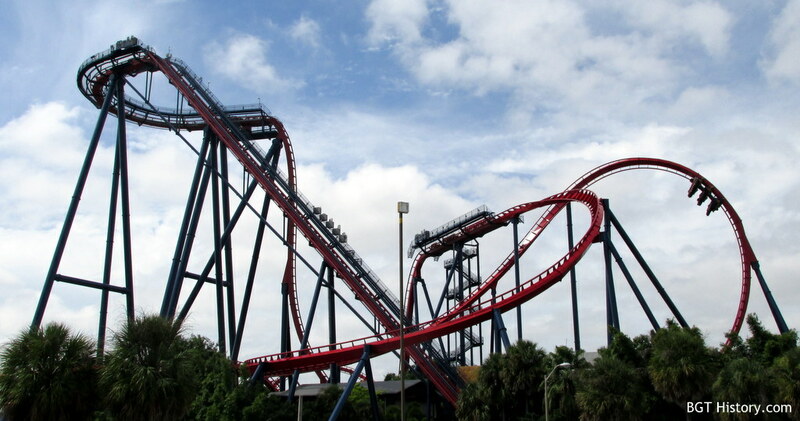 SheiKra is a steel roller coaster located in the Stanleyville section of the park. It was converted to floorless for the summer of 2007. SheiKra was announced in October 2004 as the first dive roller coaster in the United States, and only the third in the world. Stats referenced in the press release include SheiKra’s 200 foot height, a 45 degree lift hill, 90 degree first drop, and 70 mile per hour maximum speed. The new ride was also the first dive coaster to incorporate an Immelmann loop, a water feature, and a second 90-degree, 138-foot drop through an underground tunnel. The trains featured three rows with eight seats in each, for a total of 24 riders. The roller coaster is set in the ancient ruins of an African civilization, which includes various architecture and other theming details representing that storyline. The name SheiKra was inspired by a small bird of prey called “shikra” native to Africa and Asia. Along with the theming and roller coaster itself, the Stanleyville area also received improvements including the addition of Zambia Smokehouse. SheiKra was designed by Bolliger & Mabillard, who also designed Kumba and Montu. The company said it took about six months to design the layout of the roller coaster, and about four years for the project overall. The total project cost including accompanying theming was estimated at $20 million, although that number was not confirmed by the park. In late January 2005, SheiKra was topped off at the 200 foot mark. Crews placed a ceremonial evergreen atop the newly placed track segment. By late April, testing started on the roller coaster, with an announced opening date of May 21, 2005. Two years later, SheiKra went through a major change. Announced in February 2007, the roller coaster would receive new floorless trains for the summer season, with a grand reopening date set for June 16, 2007. Riders had their last chance to experience the regular trains on Memorial Day, May 28 before the coaster closed for its refurbishment. The track itself remained unchanged, but work in the station included a special floor that would raise when the trains were in station to allow for loading and unloading guests. The existing seats and shoulder restraints were moved to the new trains. On July 8, 2012, SheiKra was featured in the premiere episode of Insane Coaster Wars on Travel Channel. From January 7 through February 15, 2013, SheiKra was closed for a refurbishment which included a complete repainting. The process would take a team of 40 professional industrial painters working on shifts around the clock, over 6,000 man hours in total. It would also take more than 600 gallons of paint across 165,000 square feet of surfaces before the project was complete. Additional details and images on SheiKra will be added in the future.